A fascinating H on the lip of an Ophrys scolopax Cavanilles. Joab and Dina - thirteen and twelve years old - live in a little desert town in Israel. In the holidays, they solve scientific detective mysteries with the help of their big German shepherd dog, Blacky - a hobby that their mother dislikes. 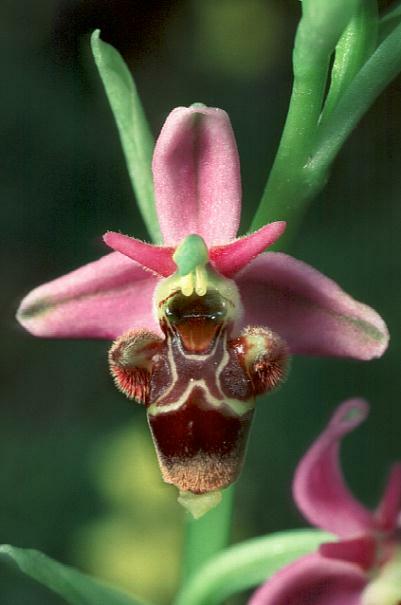 This time, mysterious letters on bee orchid flowers (see box on the left) endanger an elderly scientist. Hot on the trail, Joab and Dina surf the web, learn about genetic engineering, explore orchids, identify gold, send their dog on an electronic surveillance mission (see below) and have other exciting adventures as they seek to solve the puzzle. At the end, when the big soccer match between two school teams takes place, and everybody is at the stadium, everything falls into place - what Joab and Dina discover is nothing like what they expected. Interestingly, the author introduced independently the concept of the GPS, alongside a simplified technical explanation, since at the time the book was published (2003) he was not aware of the invention. 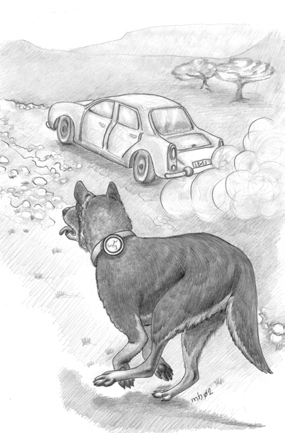 In the book "GPS" is not mentioned and it is described as an electronic surveillance system using a dog collar tracking monitor and it is also suggested as a possible method for recovering stolen cars. (see Chapters 18, 19). Look at the surprise at the bottom of this page.